Dublin Western Front Association - 22 October, 1916/2016. Back To Our Past, 22 October, 2016. Killed In Action, 22 October, 1916. John Parkinson was born circa 1895, the youngest of five children of William and Esther Parkinson, at the time of the 1901 Census the family was living at 13 Rutledge Terrace (Merchants Quay, Dublin) and by 1911 they had moved to 70 Heytesbury Street East Side (Fitzwilliam, Dublin). In 1911, John was working as a Boy Clerk in the Land Commission. 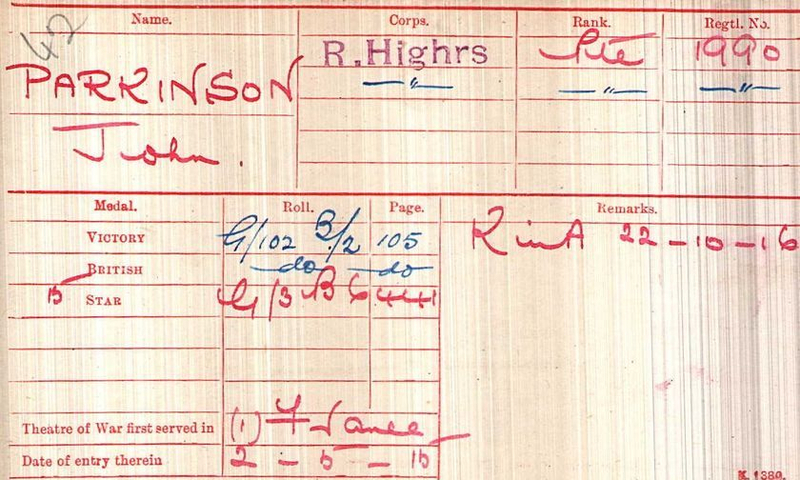 Given that John entered a war theatre on 2 May, 1915, (see Medal Index Card below) it seems likely that he joined up early in the war, indeed it is also possible that he was a member of the company of the Black Watch that had been active in Dublin for a number of years prior to the outbreak of the Gt. War, (see note below). In April 1915, the battalion moved to Bedford and were attached to 2nd Highland Brigade in the Highland Division. They then landed at Boulogne on 2 May 1915 and on 12 May the formation became 153rd Brigade in 51st (Highland) Division. During 1915 the battalion took part in the Battle of Festubert and the second action of Givenchy, and in 1916, during the Battle of the Somme, they took part in the attacks on High Wood. During October 1916, the battalion found themselves doing a lot of work under the guidance of the Royal Engineers. The battalion War Diary tells us that on 20 October they moved to tents and bivouacs between Forceville and Mailly, and on 22, after Church Parade, 8 officers and 400 men were sent on working parties with the R.E. The War Diary also tells us that on that day the battalion suffered the following casualties, 2 killed, 7 wounded (4 accidental by bomb accident, 1 of whom died of wounds; and 1 shellshock). We have no way of knowing if John was one of the two stated as ’killed’ or if he was the one who died of wounds after a bomb accident. However, the CWGC records show that John is buried in a joint grave with James Wallace, which to me would indicate that these two men were probably killed together. 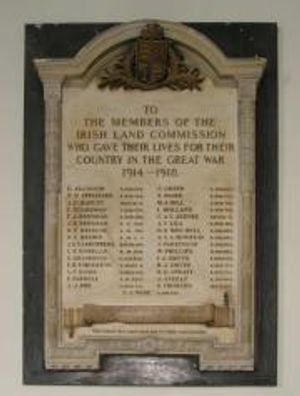 John is remembered on a Land Commission Memorial in Mornington House, Upper Merrion Street, Dublin. 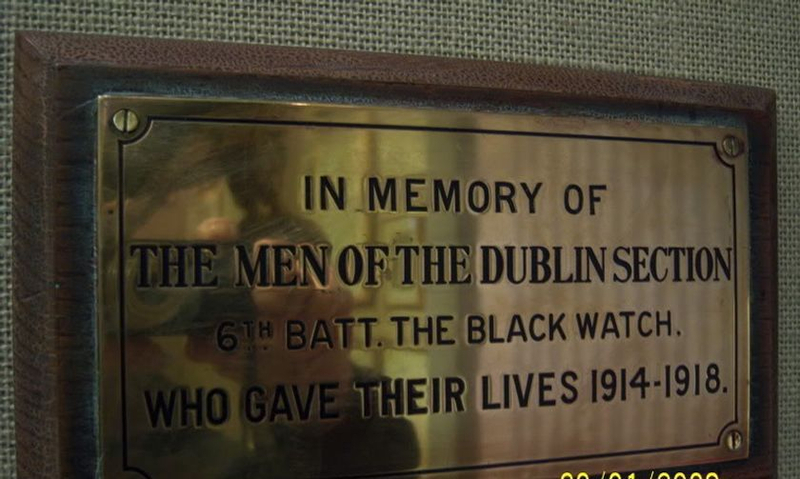 All of those from Dublin who fell while serving with the battalion are remembered on a plaque in the Black Watch museum at Balhousie Castle in Perth, Scotland. John was entitled to the British War and Victory Medals and the 1914-15 Star. On August 4th, 1914, a fortnight after the Battalion had completed its annual training, orders were received to mobilize. On the morning of the 5th, men were pouring into their Company Headquarters, where they were medically examined, issued with identity discs, kit bags and ammunition. By the evening of the same day the 6th had become an organized unit and went into camp at Queensferry. Here it was immediately joined by two detachments, one from Belfast and another from Dublin. It is of interest to record that this Battalion of Highland soldiers had well-organized detachments in Ireland in 1914, and that these joined with the same enthusiasm as did the men from Perthshire. A. G. Wauchope, A History of the Black Watch (Royal Highlanders) in the Great War, 1914 - 1918, Vol. II Territorial Force (London, 1926).